The statistic posted to Apple's App Store Support page shows 11 percent of devices are running iOS 7, while earlier iOS versions account for a two percent share. Apple drew its data from App Store visitations on Sept. 14. Compared to the same time last year, when iOS 7 was about to be replaced by iOS 8, adoption for Apple's current-generation operating system is down three points. Despite booming iPhone sales and the release of Apple Music with iOS 8.4, uptake rates have been moderate. 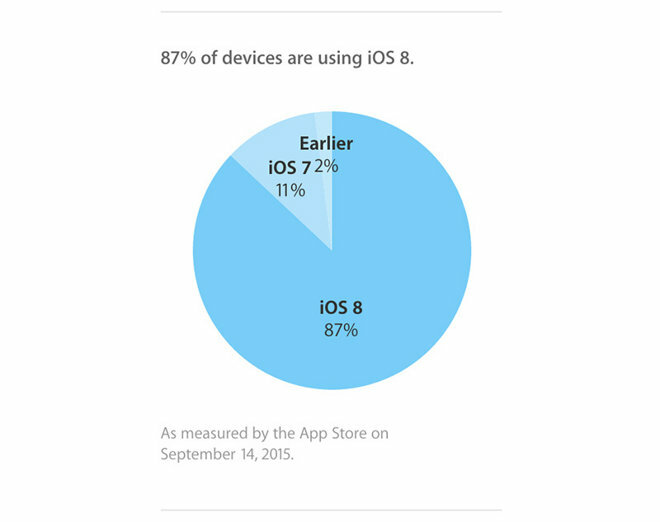 In April, Apple measured iOS 8 adoption at 81 percent. After an official unveiling in June, Apple's iOS 9 is scheduled for release tomorrow. The new operating system will bring users a number of enhancements over iOS 8, including a tweaked UI, a News app, smarter Siri interactions, iPad-specific multitasking and Transit data for Maps, the latter being a much anticipated addition. The new OS is designed to take full advantage of Apple's upcoming iPhone 6s and 6s Plus smartphones with support for pressure-sensitive 3D Touch finger input. Apple's 12.9-inch iPad Pro gets special attention with a subsystem for recognizing pressure- and tilt-sensitive Apple Pencil input, compatibility with Apple's new Smart Keyboard and support for big-screen multitasking. Apple usually releases new iOS versions at around 10 a.m. Pacific, 1 p.m. Eastern, though an official launch window has not been provided for iOS 9.